Welcome to the Donovan theme documentation. These instructions briefly explain how to setup and configure all theme features. Please be aware that the PRO Version of Donovan is an Add-on plugin for the Donovan theme. Therefore you have to install and activate the Donovan theme and install the Donovan Pro plugin in addition. You can learn how to install Plugins on the Install WordPress plugins tutorial. Donovan supports the awesome Theme Customizer. You can configure all theme settings on Appearance → Customize → Theme Options. You can find the Layout Options in the Customizer on Appearance → Customize → Theme Options → Layout Settings. You can choose between three different theme layouts – Wide, Centered or Boxed Layout. You can also configure the Sidebar position there. 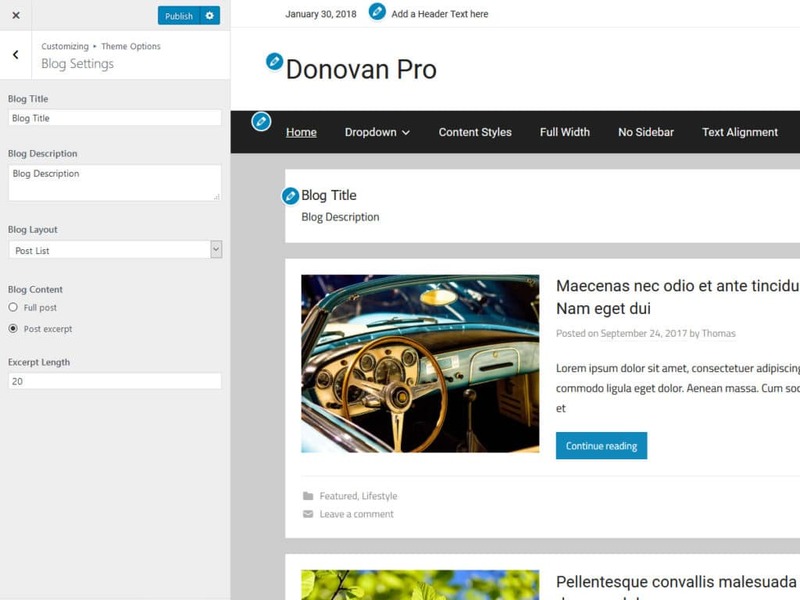 You can set the Blog Layout in the Customizer. Therefore go to Appearance → Customize → Theme Options → Blog Settings. Donovan defines two custom image sizes with an image ratio of 16:9 and 4:3. The main content column width is 910. Single Posts use an image size of 1360x765. Ratio is 16:9. For Large Post and the Post Grid Layout, the image sizes are also 1360x765. Ratio 16:9. For the Blog List layout, the image size is 600x450. Ratio 4:3. The Custom Header image will display at a maximum width of 2560 and a flexible height (default height = 500). The Pro Version of Donovan is an add-on plugin which you can purchase on the Donovan Pro page. You can download Donovan Pro on our downloads page. If you need help to install the plugin please visit our Install WordPress plugins tutorial. You can customize the theme colors and fonts on Appearance → Customize → Theme Options → Colors Settings / Typography. Go to Appearance → Customize → Theme Options → Header Settings in order to create a header text. You can also display the current date in the header or activate the search function in the navigation menu there. Widh Donovan Pro, you can use two additional menu positions to show a second navigation in the header and in the footer. You can create your menus and assign them on Appearance → Menus → Manage Locations. 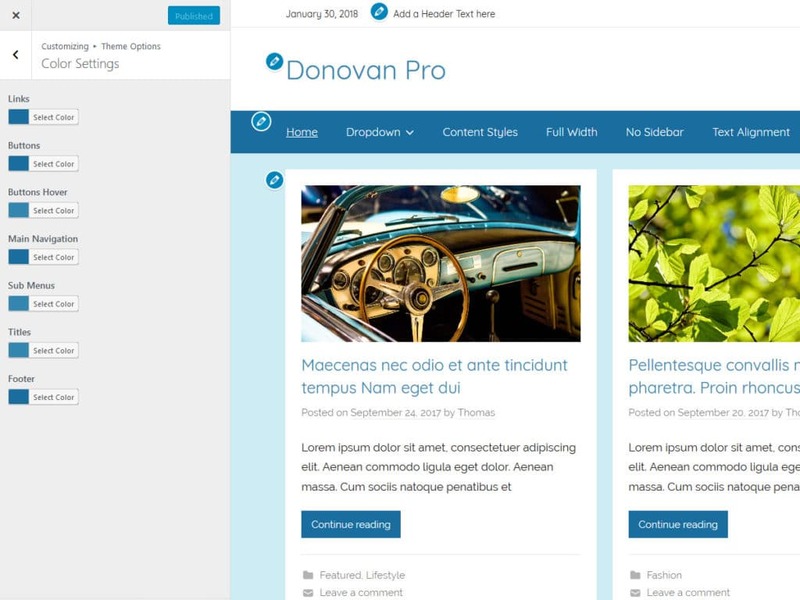 Donovan Pro adds a widgetized footer area. You can add your footer widgets on Appearance → Widgets. You can disable the credit link to themezee.com on Appearance → Customize → Theme Options → Footer Settings. You can also add your own footer text there and activate the Scroll-to-Top Button. 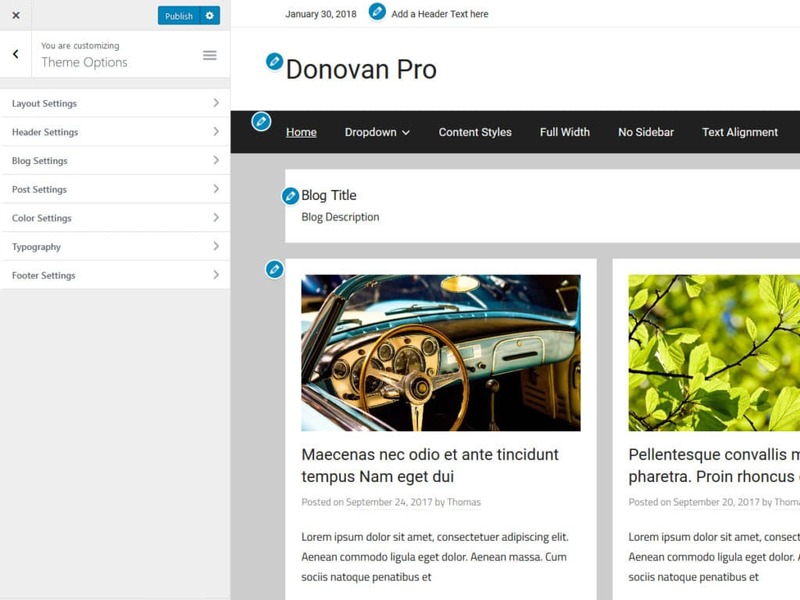 Thank you so much for using the Donovan WordPress theme.